My Storytime Bible uses playful words and fun rhymes to retell popular stories from the Bible. Intended for children ages 4 to 7, each story starts with a question to help your child think about the meaning of God's Word while you read. The pictures are colorful and vivid illustrations of the stories presented. We were thrilled to receive this book for review. The simple text is easy enough for Henry (age 6) to read independently. The pictures are engaging and Margaret loves looking through the book even when no one is available to read it to her. 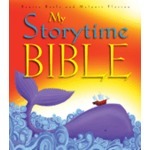 My Storytime Bible retails for $15.95 on The Catholic Company website. This book would make a wonderful addition to an Easter Basket for a young child. It was good. There was girls and boys and the kids in my class with Miss Lori liked it too. I thought the pictures were beautiful and I liked them. I thought the book was pretty funny. One of the pictures there was this little tiny fishing boat and this ginourmous net filled with fish. Hello! What a delight to happen upon your blogpost this morning. My name is Renita Boyle and I had the very great privilege of writing My Storytime Bible. It warms the hidden places of my heart to read your review AND that of your children! :) Melanie (who illustrated the book) will also be delighted.